AllTechNeed Blog is created to deliver Best Online Tips and Tricks that might be useful for people. Our Blog mainly focus on providing Best Android Tricks, Best Computer Tricks, Best Online Deals, Discount Coupons for shopping, Recharge Offers and Deals or Anything that is useful for our Audience. 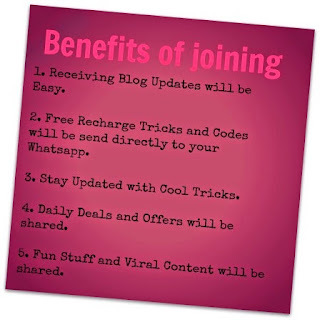 You will be glad to know that We are again Starting FREE Whatsapp Broadcasting Service through which you can receive our Post Updates, Amazing Deals, Cool Tricks directly to your Whatsapp. Read the Full post to know Why you should Join AllTechNeed Whatsapp Service? Broadcasting is Nothing but just a medium through which we can deliver best and useful content to you. We already have 100+ Happy Users that are Subscribed to our Whatsapp Broadcasting Service. As a Subscriber, They are Informed Immediately for all Post Updates and Loot Deals. Why Should I Join AllTechNeed Broadcasting Service? 2. Avail Special Offers on Time: Some Offers and Deals are Limited and Valid for very less time. Sometimes you get to Know about that Deals after their Expiry. So. Subscribe to our Channel and Get Updates on All Deals Instantly. 3. Ask any Query or Doubt: If Sometimes you are Unable to Understand our post and Procedures, you can contact us on Whatsapp. We will further assist you. 4. Free Of Cost: Yes, you heard Right. You are going to get all this amazing Updates for Free. We never charge for our Services :) . What are waiting for? Join Our Whatsapp Channel Right Now. 5. Full Privacy: I know you are very concern about your privacy. As I am. Don't Worry we value your Privacy and this Service is 100% Safe. You Number will be totally safe with us we will never share it with anyone else. So Feel Free. Note: Don't Get Confuse with Whatsapp Group and Whatsapp Broadcast Channel. We are not Making Whatsapp Group. Instead we will send you all updates in Personal Message on whatsapp. How to Join Our Whatsapp Channel ? In Order to Subscribe Simply Go to your Contacts. Add a new Contact Named - "AllTechNeed" with Mobile no. 9813300353 and Save it. Now open your Whatsapp > Contacts and Search for AllTechNeed. Now as you message your Friends simply message us - "SUB<space>Your Name"
Like "SUB Rahul" or "SUB Vinay" (Without "). We will Add you as soon as Possible. When we share any Update don't Reply with any Emotions or Make Comments there. If you want you can Comment on our Website or can mail us. Please Don't Message us for any tricks and loot offers ,If we get to know anything like this we will definitely share it. Every time We came across any Exclusive deal / Offer or Post any Trick or Hack ,we will broadcast that message using whatsapp to our subscribers. The Message will be send directly to all Subscribers as a Personal Message. Not in any type of group where people can get your mobile number So Its 100% Safe to Join our Channel.